Sponsored Post Disclosure: I was not financially compensated for this post. I did receive product to use for review purposes. All opinions expressed are my own. Happy Friday Everyone. I’m so excited to show you this awesome project I’ve been working on for the past several weeks. 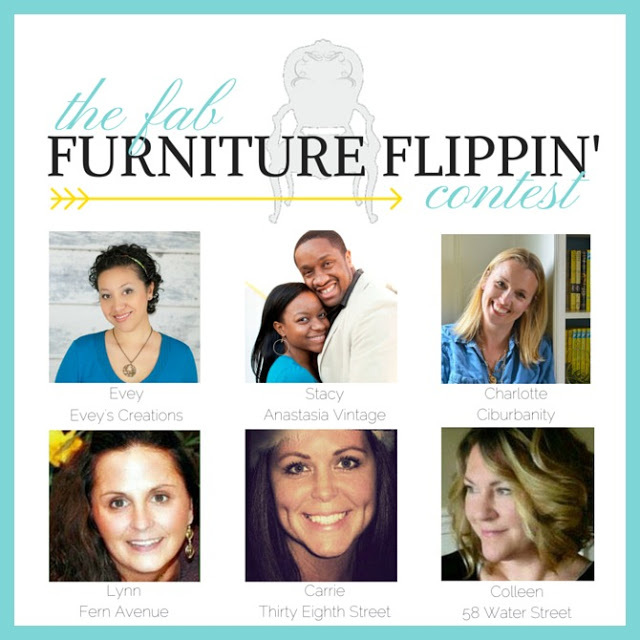 I recently entered the Fab Furniture Flippin’ Contest #FFFC, where bloggers give a piece of furniture a new life. The talented Evey from Evey’s Creations is one of the featured hosts this month. Check out her gorgeous upholstered ottoman here. The second host is the inspiring Stacy from Anastasia Village. 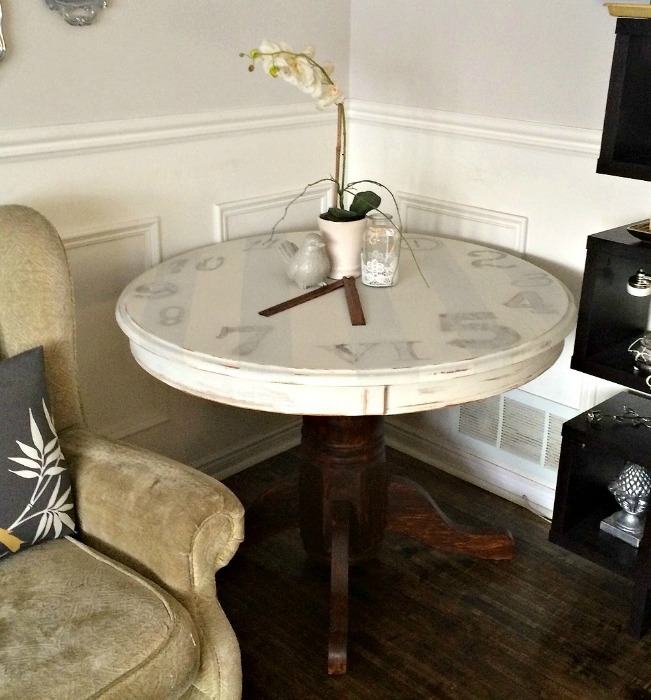 Her stunning night table makeover can be viewed here. 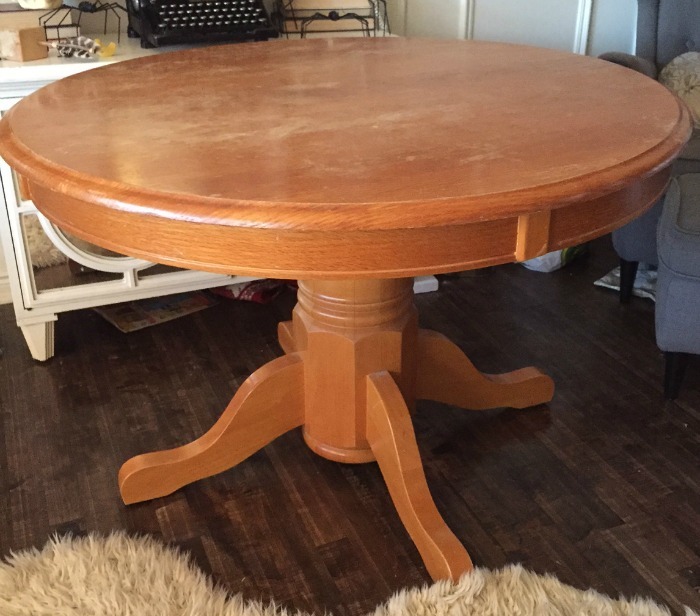 For my project, I found this awesome round dining table on my local virtual garage sale website for only $20.00; a great deal since it’s solid wood. It was screaming out for A Fresh Start… so I was like “yeah…. totes bra! 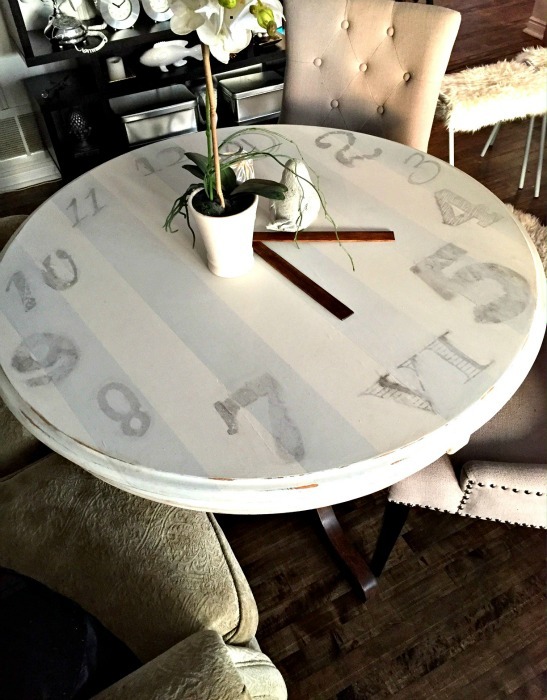 I can give you a fresh start!” I’ve had this idea rolling around in my head for a long time of doing a Clock Table, and since my home is the gathering place for all family celebrations, brunches and holiday dinners, I also wanted to add some extra places for guests to eat and gather. 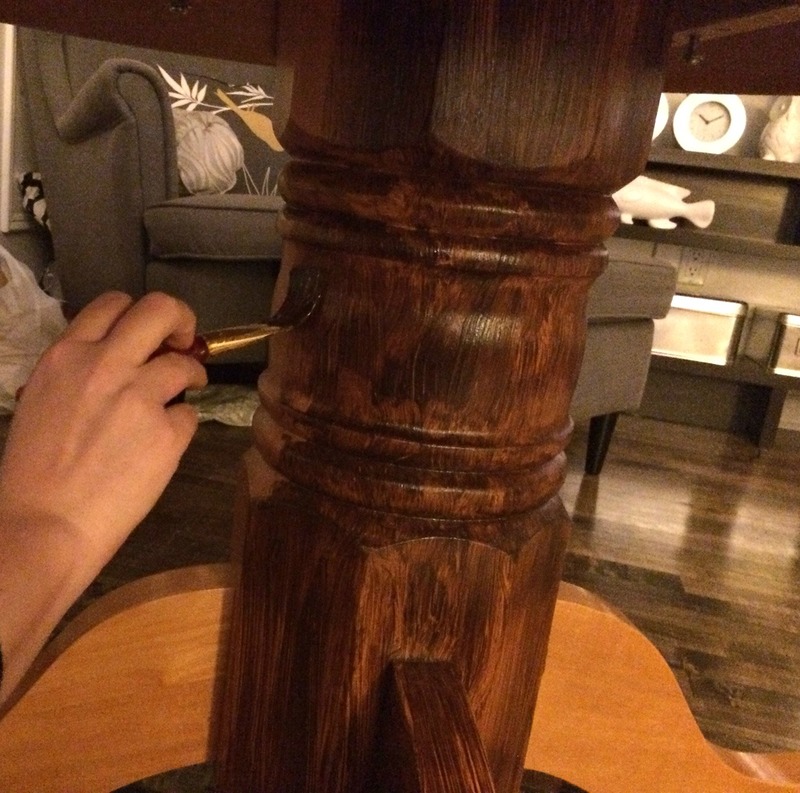 I started off with using a gel stain on the pedestal section of the table, which kept the warm wood look, but brought it into the 21st century (no offence 1990’s…. your style was boss back then). 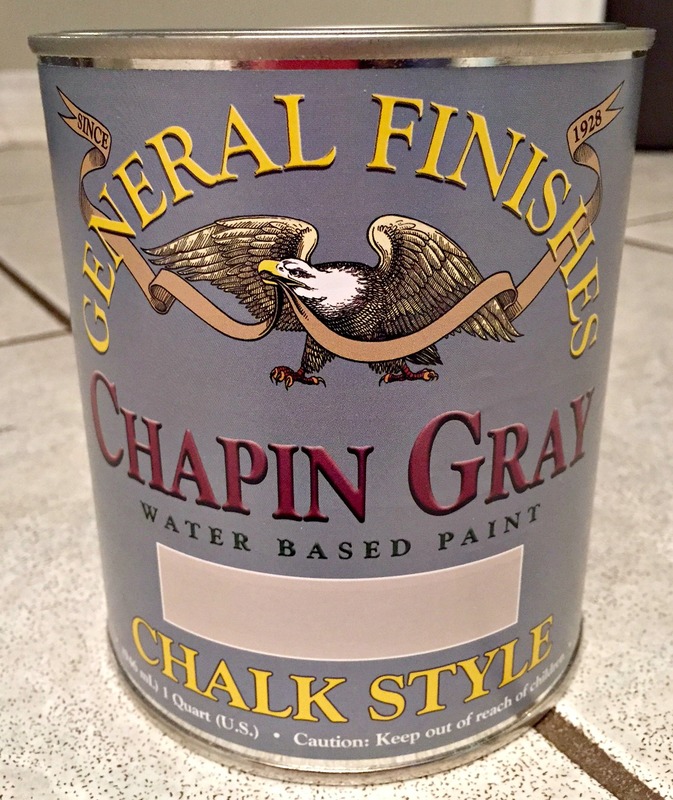 Next comes the fun part 🙂 For my table top, I chose to use General Finishes Chalk Paint in Chapin Gray. I chose this colour, as it jives with my cream and gray colour scheme in my living room, and I’ve always wanted to try using a chalk paint. The “no sanding required” aspect is pretty awesome! Here is the table top after its final coat of General Finishes paint in Chapin Gray. I seriously LOVED using this paint. It went on smooth and silky without any sanding, and dried very fast. It’s matte sheen was also perfect for the look I was trying to achieve. 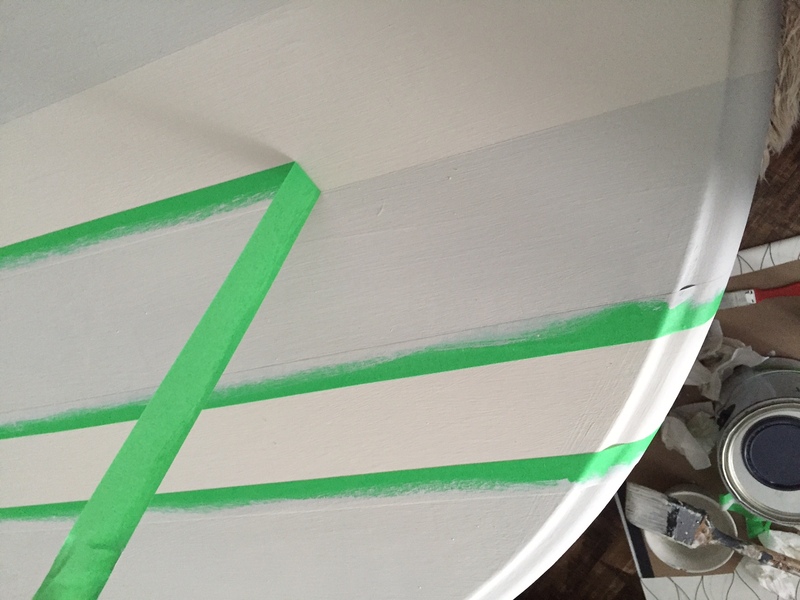 My next step was adding stripes. I added a drop (literally a drop) of black craft paint to a small bowl of the Chapin Gray chalk paint, and mixed it all together. The warm gray tone that resulted was bang on for my stripes. I taped my stripes using frog tape and did several coats of the darker gray in an alternating pattern. For my clock numbers, I wanted them to be unique and random. 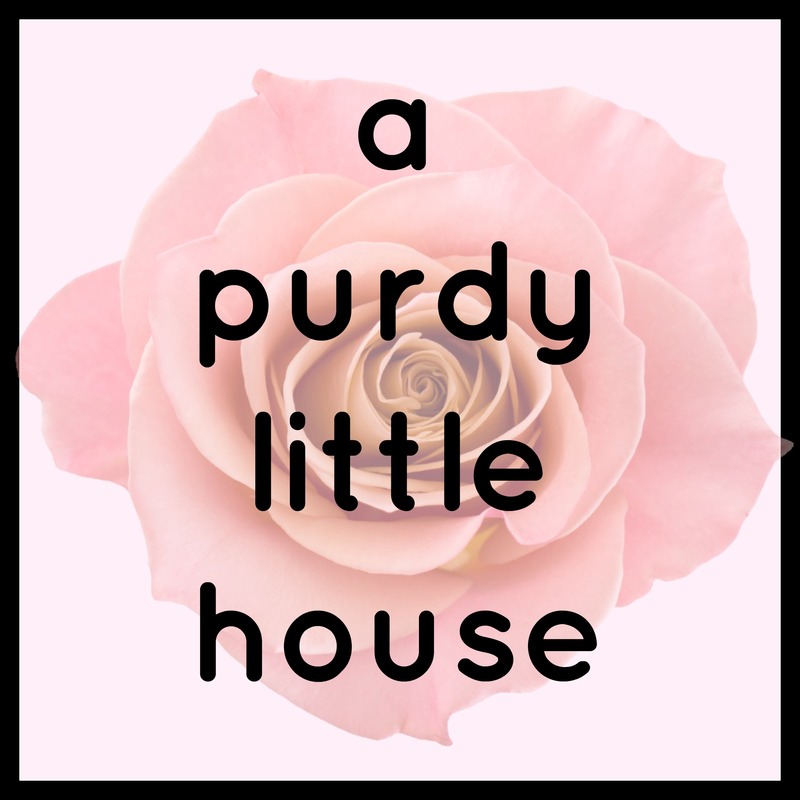 I went to PicMonkey and selected twelve different fonts and inverted them. I don’t have a laser printer, so I just used regular paper on my regular old ink jet printer. I didn’t want the numbers to be bold. I wanted a very subtle whisper of a number; something that looked old and faded over time. I put all the numbers in place and used water to wet the back of the paper and let it sit for about 15 min. 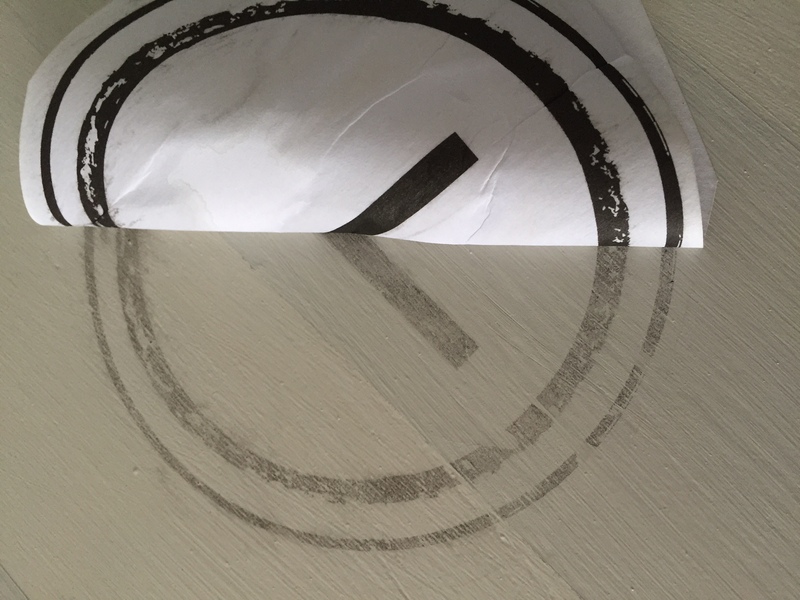 This idea came to me from seeing what happens when my kids leave paper on a surface, and then spill something and then just leave it…. Anyone else have this happen? Lol. Once everything had dried fully, I distressed the edges of the table with some sandpaper. My first attempt at distressing was sort of distressing… Nah, it was okay. It just took a couple passes and steps back to ensure that it was being distressed in the right places. I made the clock hands using paint stirring sticks and I stained them the same colour as the pedestal to help tie it all together. I figured the kids would like to play with the clock hands and maybe even learn to tell time. They aren’t attached to the table, so they can be easily removed if necessary. The new table works perfectly in our living room in front of our damask settee, and will definitely come in handy the next time we host a large dinner. When not in use for large dinners, this baby can stay in a corner of the living room and act as a wonderful accent piece. Well, except me, I suppose. I put that table in a corner Patrick Swayze. Lol!!!!!!! I’d like to thank the spectacular hosts of this month’s challenge and say how wonderful all the participant’s projects have turned out so far. 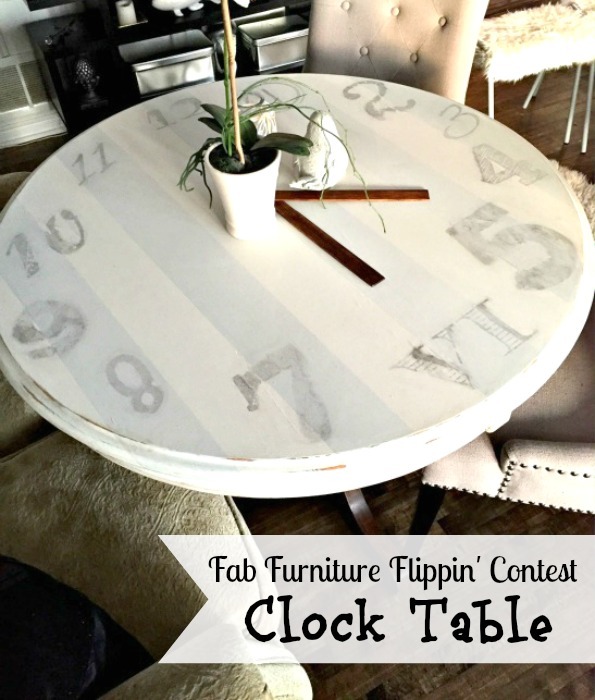 I’m honestly in awe 🙂 Any bloggers interested in joining the Fab Furniture Flippin’ Contest can email info@fabfurnitureflippincontest.com to find out more about how to participate in an upcoming contest. Shared at the Furniture Fix link party. 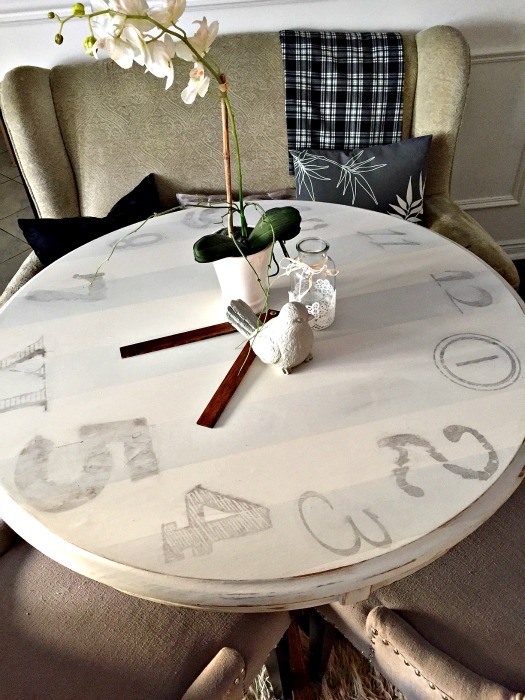 This has got to be one of my favourite clock tables ever! I love the different fonts and the transfer technique. 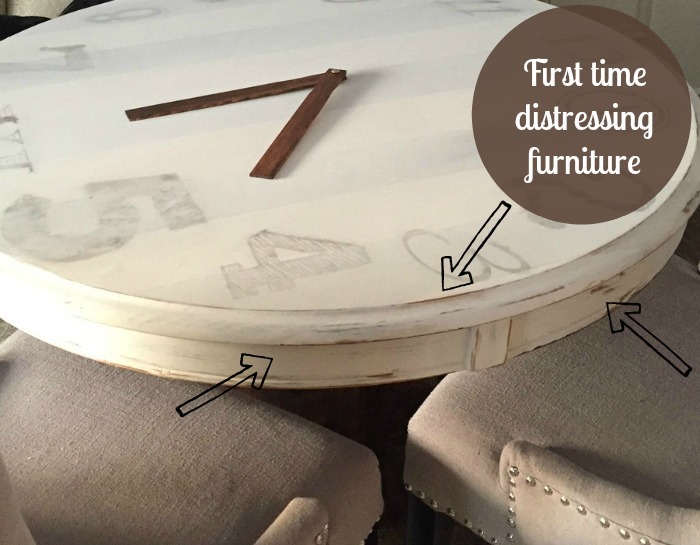 I would love it if you shared it on Friday’s Furniture Fix! Fridays at 9AM CST! Thanks so much Lucy. I’d love to share it. Is it a link party? I subscribed to your blog’s email, so I’ll get updates on the link ups. Thanks so much for the invite 🙂 I’ll definitely submit the clock table. What a great price! 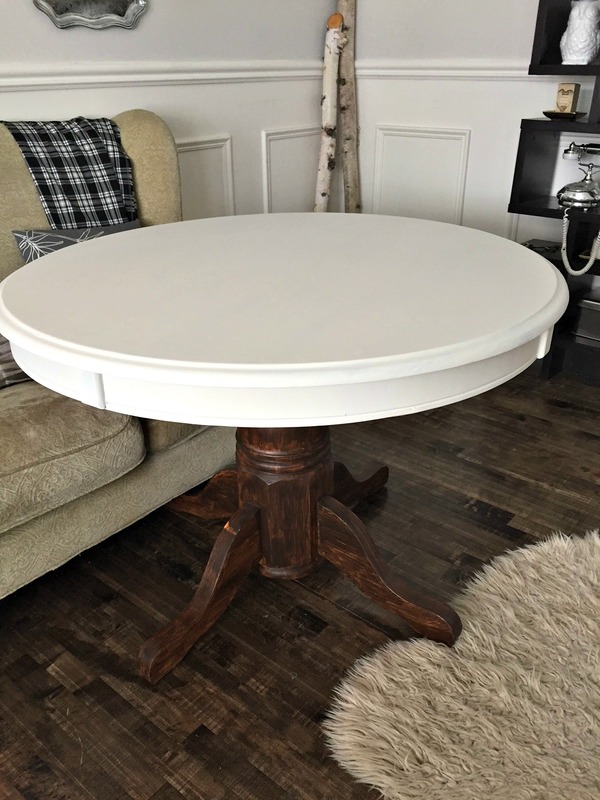 I want to find a table like this to refinish for our breakfast nook. You did a great job! Beautiful piece! This turned out super cute! Great job! 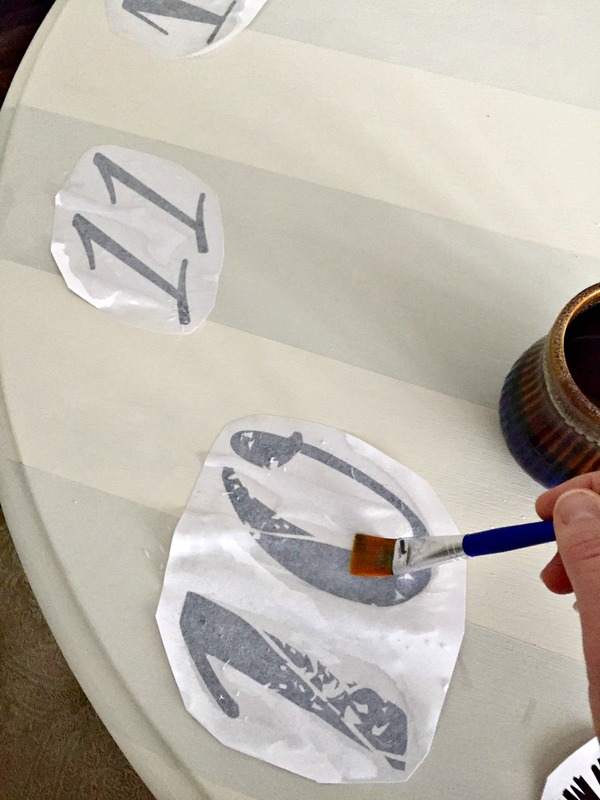 I loved how you came up with the idea for transferring the numbers – so smart! The table looks great!! 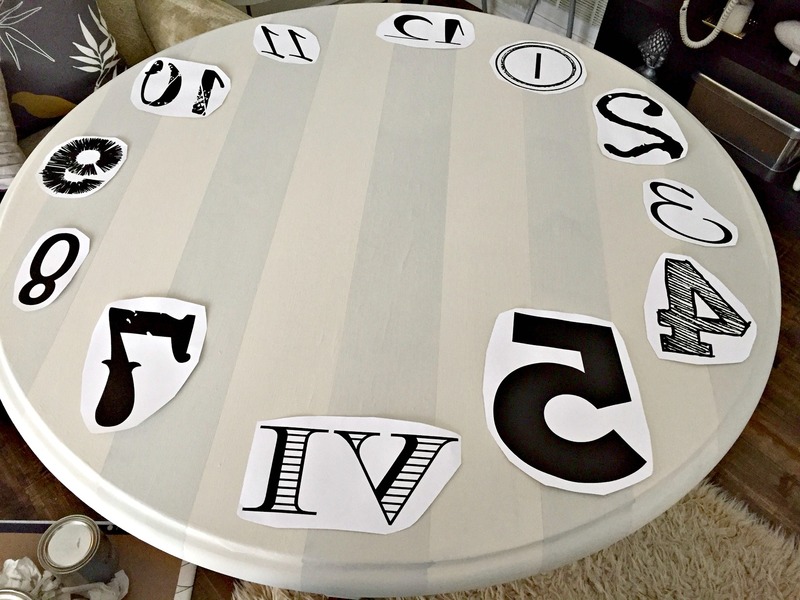 Super clever idea to subtly put the numbers on the table – great makeover! Thanks so much Dee. You’re too sweet ???? The clock pattern with different fonts is a really neat idea. Great makover. I really want to try out their gel stains soon. 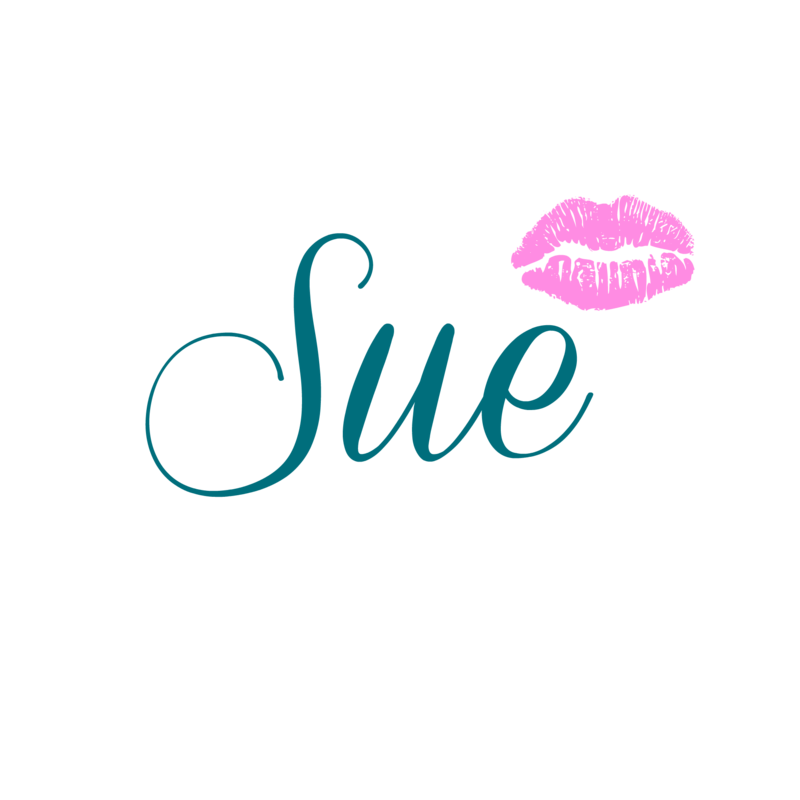 Great makeover Sue! Love the way you used different fonts for the numbers lends such a fun vibe to it. Hold the phone…. you didn’t mention if you sealed the table top with Poly ? My kiddos ruined a side table I painted and sealed with wax. What a great find, love the playful hands too! Good catch Brenda ???? and thank you so much for your kind comments. I actually haven’t sealed the tabletop yet, but I’m planning on using a matte finish poly, so the look of it will stay the same.